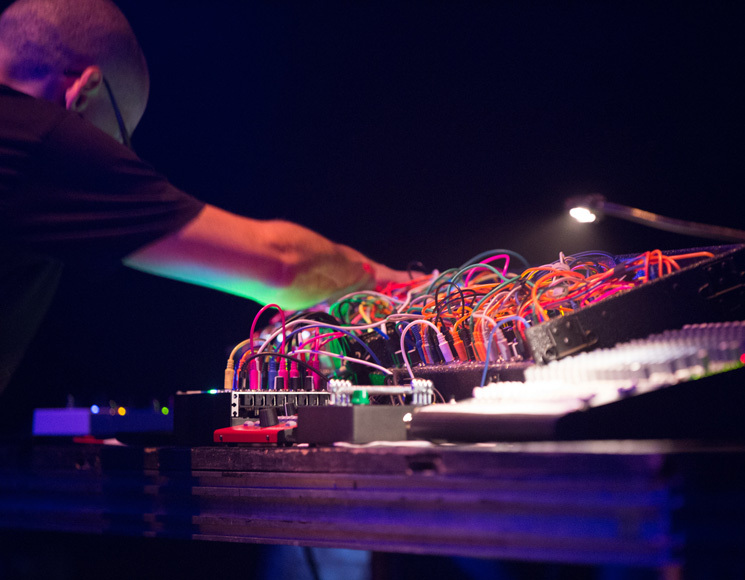 Hardware enthusiast and all-around tech aficionado Richard Devine began his Mutek performance by tapping on a Theremin-like box of tricks, to create some truly bizarre sounds, and things only proceeded to get stranger from there. At its most coherent, his show sounded like futuristic, chewed-up hip-hop, at its least, a maddening wormhole of coarse textures. Everything in between was about as interesting as it comes. Devine is usually a purveyor of pretty out there IDM — often minus the D — which is why everyone seemed to expect a motionless experience, rife with experimentation. Yet, Devine had more bodies moving than almost anyone at Mutek thus far. His set was incredibly rhythmic, far more than anyone (possibly even Devine himself), had anticipated. At times his show resembled the best qualities of Autechre, but mostly it never quite resembled anything that's been heard before. If there's one thing that Devine's Mutek performance showed, it's that he deserves to be lauded as one of the most forward-thinking electronic producers of our time. Watching him craft those unique sonic structures was a joy to behold. A fact that must have held true for the Mutek staff, who didn't dare stop his juggernaut of a set, even though he went well over the allotted time. By the end of the hour-and-20-minute show, it was hard to tell whether Devine was controlling the modular synth or vice-versa. Whoever was in charge, the results were simply outstanding.